"There is no obvious difference in patient selection. The Japanese accept almost as high a proportion of diabetic patients as does the United States, and the mean age of incident patients is higher in Japan." 7. Regulations promulgated by the Colorado Department of Health and Environment require one RN with at least one year of experience in the area of dialysis, to be in attendance in all certified dialysis facilities during operating hours. 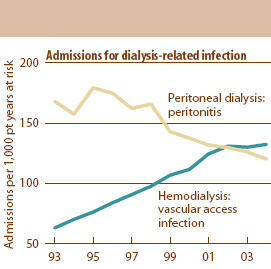 Due to the nursing shortage RNs with NO dialysis experience are many times in attendance. grew 106 percent, the total number of deaths 123 percent,"
non-Medicare costs from heath plans and other coverage were $2.2 billion—a total, then, of $8.0 billion from all sources (see Figure p.6 on page 17). By 2001, costs of the program had reached $22.8 billion, almost triple the earlier level of expenditures"